wow, that indeed was a very nice thanksgiving Manisha, with those wonderful gifts and above all meeting a friend after so many years. that itself is a gift on it's own. All home made goodies too.YUM!! Have a good time catching up with friends. I know how you must have felt to see your friend after so many years. Being in England all this time,the one thing I miss the most is my friends back home. You actually made an appearance....the summons we gave worked. Yayy !!!!! I felt so happy just by reading your post. Those mountains are so beautiful !!! I love Colorado. Apart from the one pumpkin disaster(yes, i count that as one.. the burfis are not counted because you served them) I think your Thanksgiving rocked. I too met a friend after 11 years, Manisha, it was such fun! 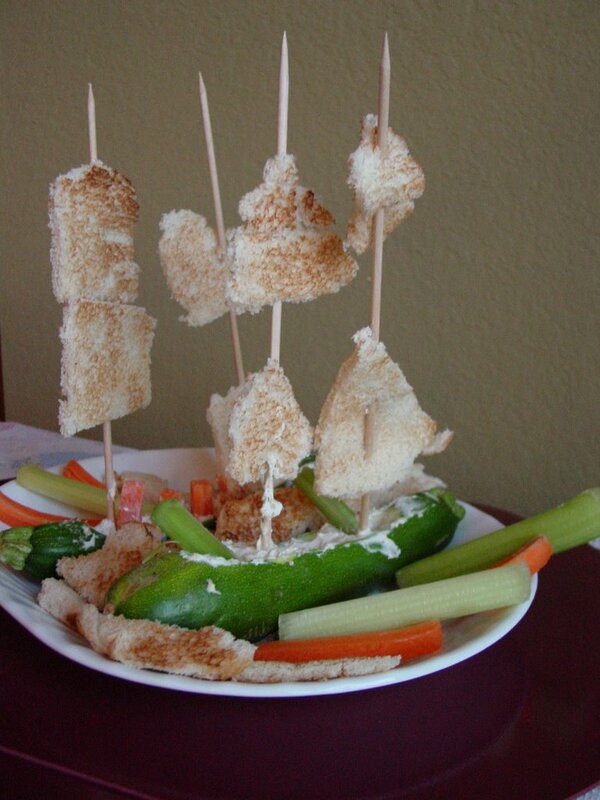 Nice effort, those zucchini boats and bread sails! Your week sounds wonderful, friends new and old, family, good food, what more can you ask for-it's perfect. Lakshmi, very well said! It was a wonderful celebration indeed! Asha, these days I take inspiration from you and the fantasic spreads you lay out in your home. If it didn't mean having to go through the teenage years again, I would happily be reborn into your family as your third child! Anupama, we've moved so often in my lifetime that each one of my friends is extra precious. Hugs to you, cos I know exactly how you feel! Mythili, I quaked in my shoes...er, ok! feet warmers and braved against high tides of work to make this post, just for you! The orange burfi fiasco has been analyzed and I will update my post on what not to do. :-D I still have that pumpkin in the fridge. I wonder if making parathas is an option. I can't bring myself to throw it all away - at least, not just yet anyway! sra, those bread sails were a story by themselves. It took the girls a while to figure out that the sails need to be much smaller and lighter if they have to stand up in the boat! After a brief lesson in physics and the center of gravity, they finally figured out that the entire universe was against them having large sails and gave in and made smaller ones. You can see that they still managed to get one skewer in with large sails. As for those skewers, they got them free at Wild Oats. Yes, Wild Oats does make lapses of this nature once in a while and I never heard the end of how they didn't have to pay anything for those skewers! Lee, in its own way, it was perfect! I was very content at the end of the day! Manisha what a lovely Thanksgiving. Loved reading every bit of it ...okay not the fiasco part and I am sure you made it sound much worse than it actually was, but the old and new friends part. Lovely write-up, Manisha. The picture of the mountains is breathtaking! It must have been so much fun catching up with old friends and meeting new ones. 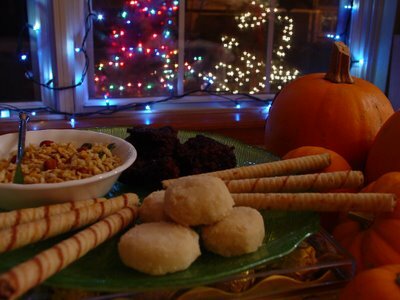 Hi Manisha, I enjoyed reading your Thanksgiving post. And thanks for dropping by my blog and your greetings. I contributed cole slaw and hot apple pie sundaes to our Thanksgiving dinner at my mother-in-law's, and enjoyed time spent with my husband's family. Ashwini, the burfis were very good! I think I know what went wrong with the pumpkin. It was easier to chop and peel than the last pumpkin I used. So we sliced the peel off without losing any of the pumpkin flesh. And I think we got more of the 'cheek' from the peel than I bargained for. I have 2 more pie pumpkins sitting on my counters so I should try making some more this week! I'll make it and freeze it right away so we don't get sick of pumpkin curry! And by the way, one way to test for true friendship is to offer a really awful tasting dish to your friend. If she gets a look of sheer dismay on her face, reaches out for a glass of water and then tells you it's yuk, she's the best friend you'll ever have! The mountains never fail to amaze me. They represent calm and might to me. I am very lucky to be just an hour away from the RMNP. I haven't had the time to upload more pictures to my photoblog. But I will. All we did was walk around Sprague Lake and then come back home cos the girls wanted to go swimming. It was worth every bit of the drive there and back! Manisha, I guess you can make pumpkin idlis with those remaining two pumpkins. There is a sweet and savoury version, both taste amazing. 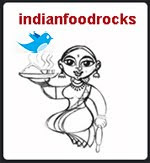 As you like idlis, you might like them too (unless you are like my husband who likes only normal idlis :D ). Well....there is nothing in this world like a good friend. My husband's best friend married my best friend recently and I can't tell how much we miss them. I am very very happy that I got a new friend this thanksgiving and I enjoyed every bit of it.